Dawn Devine provides an introduction to belly dance costuming, suitable for newcomers to the dance form. It explores a variety of different costume items, including different types of hip garments, dresses, skirts, blouses, and vests. This 110-page book is primarily intended for someone who is brand-new to creating belly dancing costumes, and needs ideas on where to start. It describes the basic clothing items that might be used in a dance costume, and talks about how to assemble them into a completed ensemble. Extensively illustrated, it includes diagrams that will help you draft your own patterns for blouses, vests, pants, caftans, and more. I have done extensive sewing, but I think it would be difficult to create a pattern from these diagrams. They are not drawn to scale, and it would take a great deal of effort to draft a pattern based on them. The drawings offer enough information that someone with a large amount of experience in drafting patterns could do it, but most of us would do better by buying a commercial pattern. Costume styles included are both the "nightclub" look and the more covered historical look. Although this book was written before Tribal style achieved the popularity it enjoys today, many of the costume ideas it contains are relevant to the needs of Tribal style dancers. In addition to describing the basic costume components, the book provides further valuable information. I'm sure many dancers appreciate the chapter about various body features such as short neck, small or large bust, full upper arms, short or tall frame, wide or narrow hips, etc. and how to design costumes that make them look their best. Although the overall book addresses the costuming needs of women, there is a special chapter on costuming for male dancers that may prove helpful to this often-ignored minority group. It talks about shirts, vests, hip accents, pants, and head coverings especially suitable for men. For me, the strongest characteristic of this book was the fact that it is liberally illustrated. Many drawings of dancers in costume clarify what the text is describing, and provide inspiration for ways to assemble the various components into a final ensemble. The abundant supply of diagrams showing how to draft patterns for the various costume items should prove very helpful to people who are proficient at sewing. You know nothing about belly dance costuming and need a starting point. You are already comfortable with a sewing machine, or have your costumes made for you by someone who is. You would value recommendations on how to choose a costume style that is flattering to your body type. You would enjoy a large bibliography suggesting many additional books that could be helpful in planning your costume. You are looking for advice on costume care and handling. You're thinking about going into business making costumes professionally and would like some advice geared to such a business venture. You are a male belly dancer seeking costume ideas. You are already very knowledgeable about belly dance costuming and don't need an overview. You're looking for a book that takes a narrow subset of the costuming topic (such as how to cover a bra with costume fabric) and provides in-depth detailed instructions. You're looking for a book that will provide instructions on how to sew. You're looking for tips on how to sew with the difficult-to-use fabrics that are common for belly dance costumes such as glitter dot, chiffon, etc. The notes about historical and cultural garments are helpful. 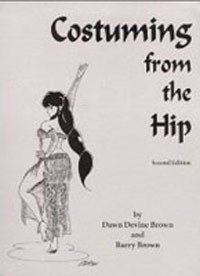 The book provides many ideas for dancers seeking to create an original look. The spiral binding makes it easy to leave the book open to a certain page. The book's 6-page bibliography provides a rich list of additional resources for dancers looking for inspiration. The information in the book is helpful not only for dancers sewing their own costumes, but also for people planning to buy a costume. The book contains suggestions for taking care of costumes. The book provides tips on how to start a business making custom costumes for people. Most topics are covered at a very superficial level. The diagrams showing the shapes needed to make various costume pieces are not drawn to scale. There are some distracting spelling errors. The spiral binding makes it impossible to determine by looking at the spine which book it is when it sits on my bookshelf. The book has a very home-published feel to it. For example, the page layout is amateurish, and the use of different artists to create the illustrations makes it feel as though continuity is lacking. Newcomers to belly dancing might not know where to start in making or buying a costume. This book provides a starting point. Because it covers a large number of topics, it is not able to explore any one of them in great detail. But as an introduction to the topic, the book works very well, and is one that I'd readily recommend to belly dance students.